Typically, I make one or two blog posts a year from the lovely Mad River Valley, just outside the confines of our own Addison County. For one, it gives me an opportunity to share an area just a little farther away, but still within pretty easy geographical reach of most of my readers, as well as the fact that I am usually visiting my extended family when I am in the Waitsfield area, and it is good to get out of the house for a run when traveling. So, on a pleasant, spectacularly sunny, but not too hot August afternoon, I decided to explore a footpath that I knew little about – the Mad River Path in Waitsfield. Many people know of the heavily used and well developed bike path weaving alongside the river in Stowe, a few towns further to the north, but few know much about the Mad River Path. I only knew of its existence having seen a few signs alongside a few points where the path has road access, but prior to this run, knew nothing of its condition or extent. I chose to start this run from a point which is currently the southern terminus of this path, near the Lareau swimming hole on the Mad River. 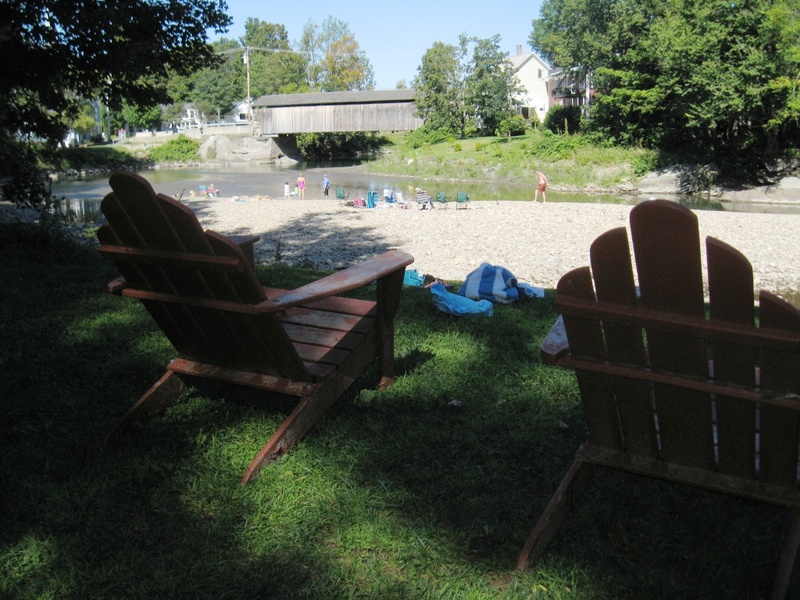 This popular, family-friendly swimming hole has a large parking lot, which is often nearly full on hot weekend days, a small beach, a larger grassy area (which is starting to recover after the ravages or Irene!) and a great rock for exhilarating, but reasonably safe leaps into the deep pool below. I had presumed that the run north from this point would be on a path, more or less hugging the Mad River, and was initially disappointed to note from the map posted that the Mad River Path is, at this point, a series of short riverside sections which return to the highway as private property owners and/or terrain force the path away from the shore. So, I set off on this run guided mostly by the thought of hugging the shoreline whenever possible, returning to the highway for the shortest possible stretches when necessary, and respecting private property when posted. 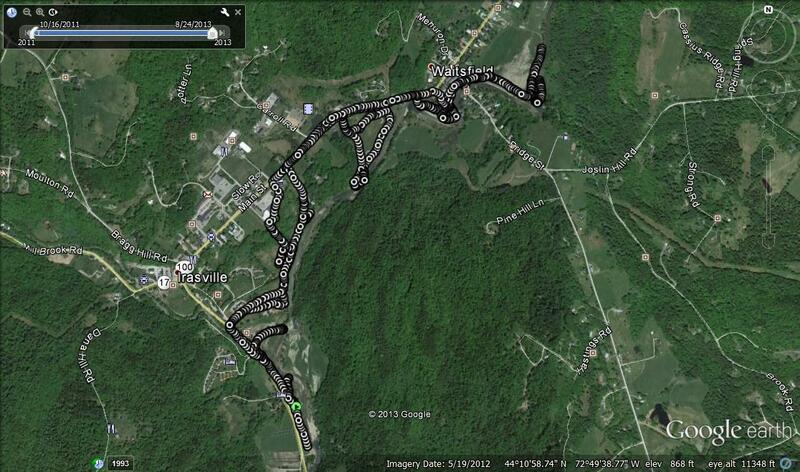 As a result, a quick glance at my GPS trace from this run looks somewhat disjointed, as a series of loops emanating from Rt. 100. So setting off north through the woods between Rt. 100 and the Mad River, I came to the first obstacle to a continuous run – the Mill Brook, which is a broad stream cascading down from the higher elevations. There was a path which followed the south shore of this path to its confluence with the Mad River, but not obvious place to ford the stream easily. Maybe someday the town can raise the funds necessary to build a footbridge here? Doubling back to the highway bridge, I followed the shoulder of Rt. 100 until I reached a small side road called “Fiddler’s Green” which brought me back to the riverside, and the next segment of the path. The path here wove past intermittent views of the river, and a picnic table in a quiet place before coming across a small, and frankly more interesting car graveyard. While this place served as a stark reminder that this area was far from wilderness, I have always found abandoned old cars in out of the way places oddly attractive and photogenic. 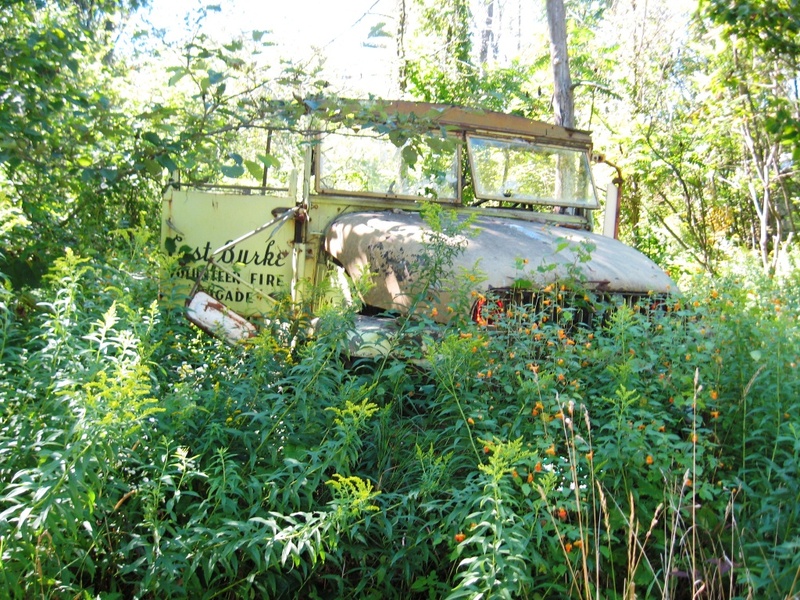 This particular vehicle’s door insignia indicated that it had once served the East Burke VT Fire Department! The path then veered to the left, up the hill past some private residences and businesses until it rejoined Rt 100 just north of the Mehuron’s strip mall. Continuing north, the next opportunity to join the river bank was afforded by the wide expanse of the town ball fields, which were also recovering nicely post-Irene. The lush green of these fields make it hard to believe that just two years ago, they were muddy flats, left behind as the Mad River, swollen by Irene, subsided. This right turn towards the water, brought me to a small muddy riverside beach, where I noted a few water enthusiasts exploring the river the best way – by innertube. 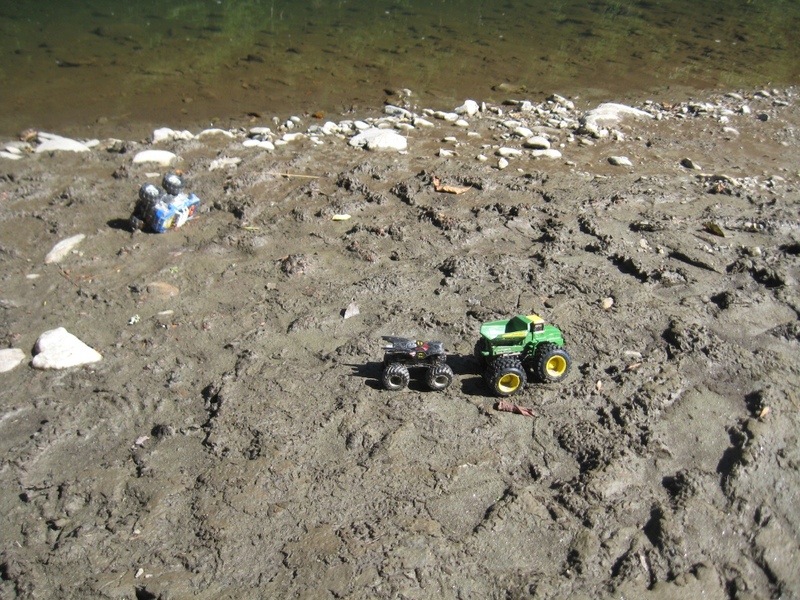 I also noted several abandoned child’s toys alongside the river bank – not inappropriately toy trucks with tires suited to imaginary driving in the muddy riverbank. Unfortunately, most of the riverfront near to the ball fields was separated from the parkland by a thick hedge of trees, so after a loop around the field looking for secret passageways to the water front, I returned to the highway having found none other than the one access point. Continuing north, I reached the more developed section of waterfront close to the Waitsfield covered bridge, which miraculously escaped Irene’s fury more or less unscathed. The official trail commenced along this short section of waterfront, which also serves as another popular mid summer swimming hole. I found myself cursing the fact that I had left my wallet back in my car, so couldn’t get a cone from the hard ice cream store in the village. This store is a favorite, as they are one of the increasing number of ice cream parlors which make ice cream in non traditional, sometimes savory flavors, in addition to old favorites. On this perfect August afternoon, there were quite a few families hanging out, enjoying the cool water just upstream from the bridge. While this segment of the Mad River trail ended at the covered bridge, the open meadows to the north invited further exploration, so I continued on. I couldn’t figure out if the mangled chunks of steel alongside the river bank were the results of some grievous damage from past floods in the area, or misguided attempts at modern sculpture. Really. After about a half mile in this meadow, I turned around to make my return, as I only came across one short path with river access. My return to my car mostly involved reversing my path on the way out, other than the fact that I did discover another path accessing the riverside from the back of the cemetery alongside Mehurons. At the end of this run, which ended up at about 6 miles, I enjoyed the bracing waters of the Mad River before heading out. Why is it that I am usually the only person over 18 ever swimming in these cold waters?